Find, Analyze and Overcome Marketing Threats. With Your Team. Uncover Marketing Threats and Opportunities. You’ll be able to track the progress, metrics and tasks for each page on your website. Up to a total of 300 pages (this can be upgraded). It also allows you to uncover pages that work amazingly well for your business, and those which don’t. 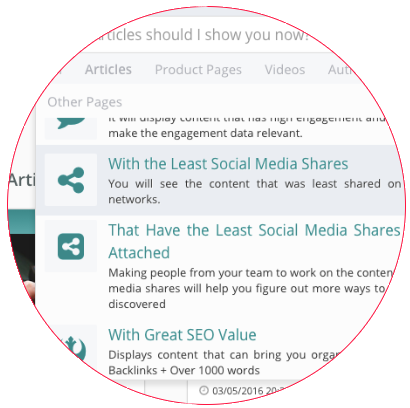 Bring your whole marketing team together in ContentLook and achieve better results. 300 Pages you can track for your site. 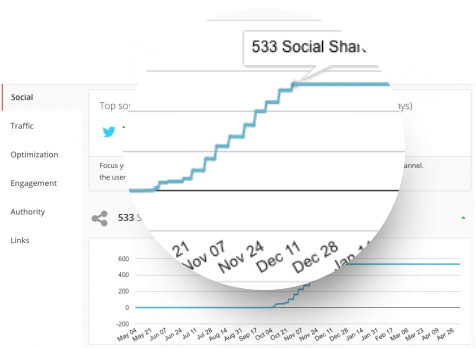 30 Days of Tracking History for Social Metrics. Other Free Tools only crawl 10 pages once and give you a report. ContentLook Free offers you data for up to 300 pages and it constantly reviews them for you. Track more pages. Use ContentLook. 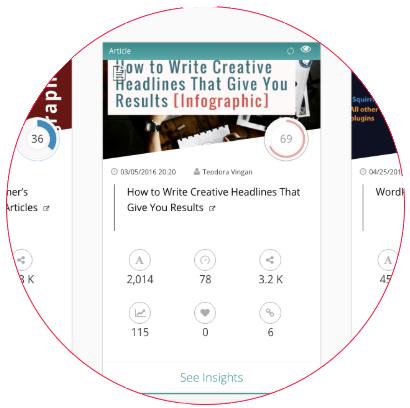 Ask ContentLook to show you the pages that were way above average. 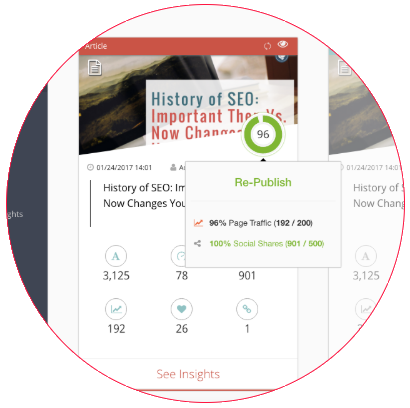 Once you identify the pages that work great for you, you can use that to either start a re-publish campaign at a later date, or get your team to share those pages to your other marketing channels. Quick Metrics: For Each Page. A quick glance will allow you to see the metrics that you care about. All while browsing the pages that were tracked. 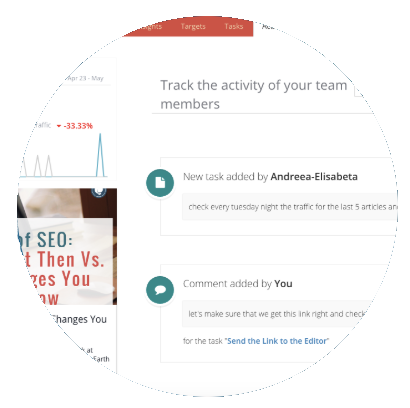 Displays your open graph image, shows the KPI progress for your campaign and other info like: authors, word count, traffic, engagement, social media shares, backlinks, page SEO score. You can change the quick metrics that you see according to the role you have on the website: SEO, Social Media or Online Marketing. This helps you see only the metrics that you will act on. Ask ContentLook to show you only specific pages. 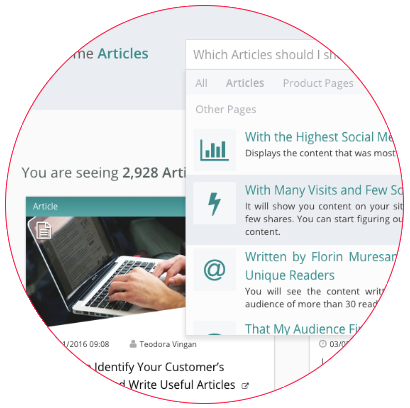 Ask ContentLook to show you only the pages that under-performed for your marketing strategy. See the ones with low engagement, low SEO score, low traffic, low social media shares. These pages are dragging your website authority down. Completely customize the requests you make. Better ways to ask: Advanced Filters. 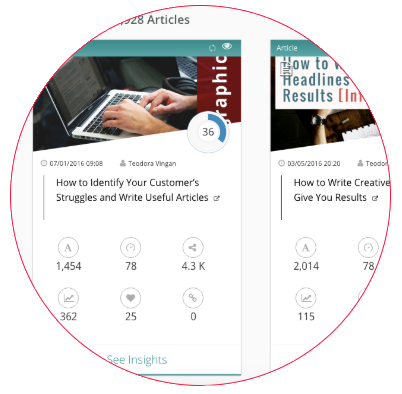 With Advanced Filters you can be very specific when you ask ContentLook to show you the pages you need to narrow down. Plenty of filters to choose from: Campaign, Social Media shares, Optimization Score (SEO), User Engagement metrics, Keywords and many others. Manage All Your Content. With Ease. It’s Easy When It’s Visual. 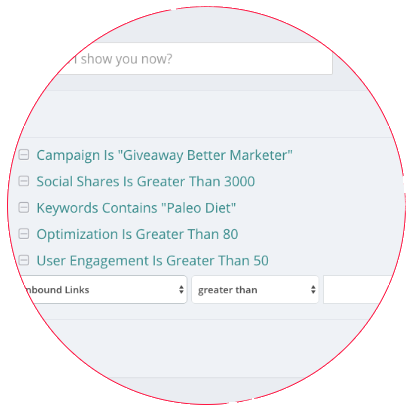 You can ask ContentLook to show you only the pages that belong to a specific campaign. This will help you get a quick glance of how much more you need to push the pages to reach the desired KPIs for the campaign. KPIs and Campaigns. Start a Free Account Today! Your Marketing Team. On the Same Page. One Panel To Keep All Your Team On The Same Page. On Any Page. With ContentLook, your whole team will have access to the activity feeds of each page on the website. If you’re currently working to change a product page from the store, or you’re switching it to a new campaign, all your team can easily find out. Don’t Lose to Bad Communication. Start Using ContentLook Today. See How Your Metrics Evolved. With the Free Plan, you’ll be able to have access to graphs that show the evolution of your pages over different periods of time. This offers you 30 Days x 300 Pages = 9,000 Days worth of data points. For every single channel, not just an overall view. Create Your Free Account Today! ContentLook is made by Squirrly, the Better Marketer Company. Millions of people downloaded our Digital Marketing software products. From 2013 to 2018 we’ve helped over 134,000 people become better marketers through our informational products (courses, ebooks, webinars). 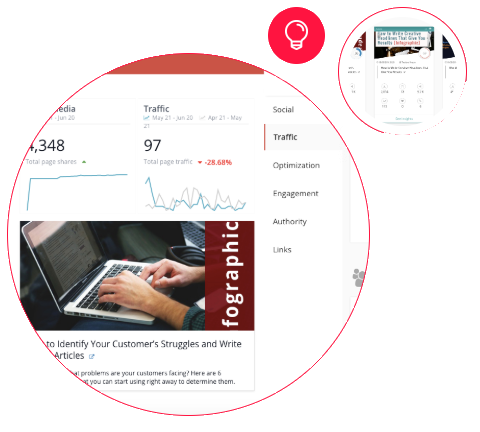 Optimize Your Content, Drive More Traffic, and Turn Your Business into a Lean, Mean, Lead-Generation Machine with Contentlook!